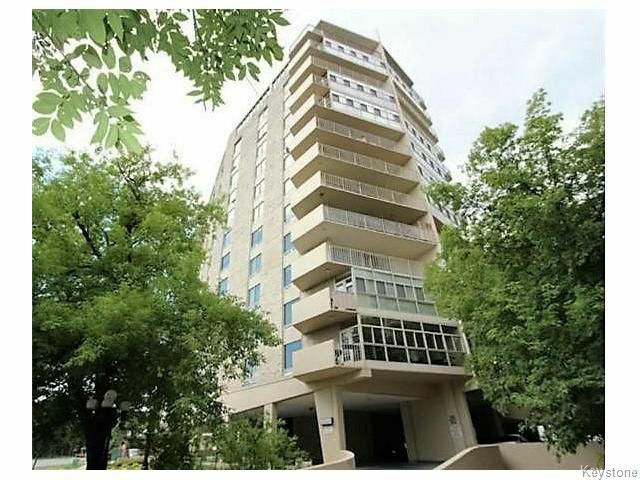 Welcome to Wellington Crescent...Winnipeg's most prestigious & luxurious location. Starting with the full time doorman, to the underground parking, to the high ceilings and natural light, to the open concept kitchen, to the hardwood floors & in-suite laundry, to the closed-in wrap around balcony (A $40K improvement) on the rarely offered 11th floor w/panoramic views of the fireworks at the Forks and amazing daily sunsets, it is thoughtfully designed & maintained for the comfort you richly deserve. The long time owner is sad to leave, but has graciously taken care of all of the previous building improvements (garage, riverbank stabilization, roof, furnace, & common area) to provide the new owner a clean slate & peace of mind. Aside from the cachet of the Wellington Cres. address, what's most impressive is the true convenience of the location. It's (a perfectly safe) walking distance to both Osborne Village & Little Italy, as well as a manageable bike ride to Assiniboine park or to the Forks & Downtown.